We arrived at Knockendarroch as dusk was falling and knew we were somewhere very special indeed. As we parked the car, we peeped inside the picture windows to see roaring log fires, twinkling lights and sumptuous sofas. 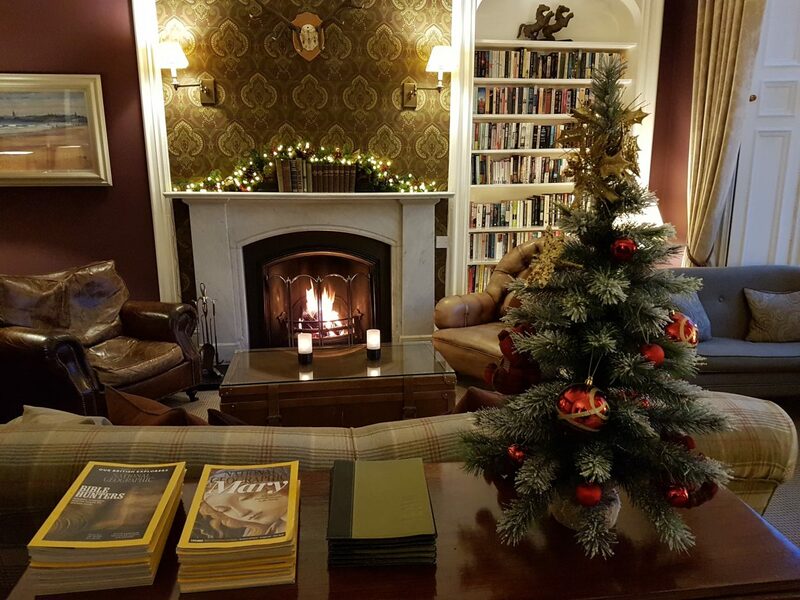 Pitlochry isn’t far from the central belt, so we arrived relaxed and ready to put our feet up beside the fire with a G&T in one hand and a book in the other. After a warm welcome and efficient check-in, the fires beckoned, but we decided to explore our home for the night first. Knockendarroch was built in the late 1800s with no expense spared. 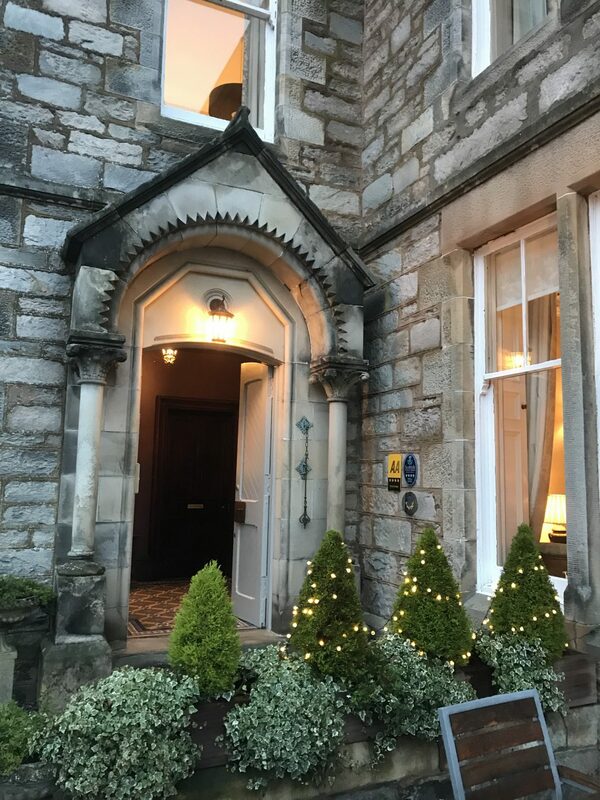 It really is one of Pitlochry’s most beautiful properties. The house is stunning throughout with a carved grand staircase, stained glass windows and decorative cornice work. Home to the town’s original “Theatre in the Hills,” it’s quite apt that the view over the rooftops and across the river is towards Pitlochry’s ‘new’ famous theatre. In 1951 Knockendarroch’s garden housed the original theatre in a huge tent amongst the great oak trees before it moved to the new site in 1981. 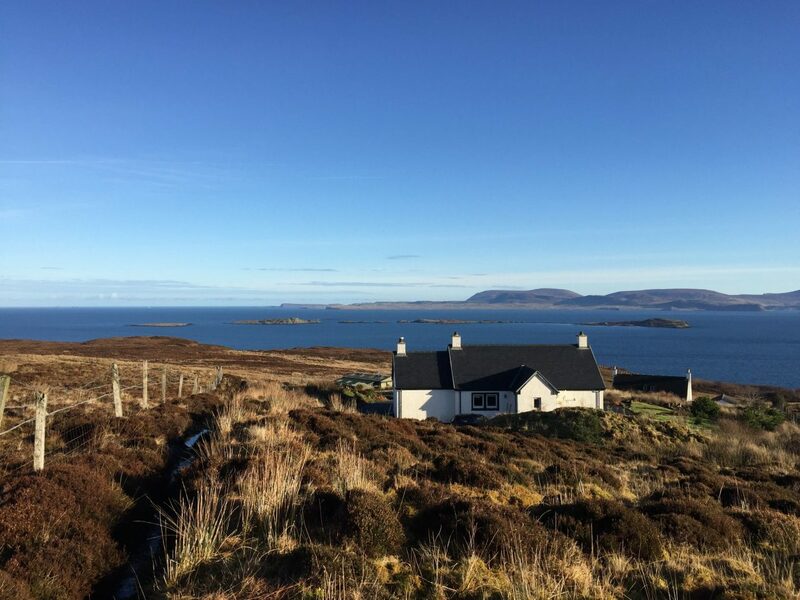 Owners Struan and Louise Lothian have very successfully transformed the property into Scotland’s Hotel of the Year 2019. 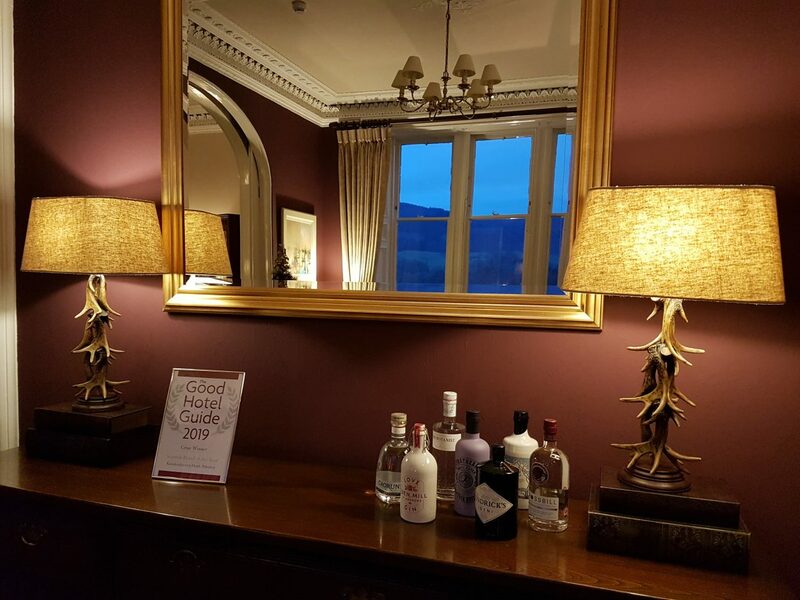 Their recent award from the Good Hotel Guide takes pride of place in the lounge next to the gin bar! 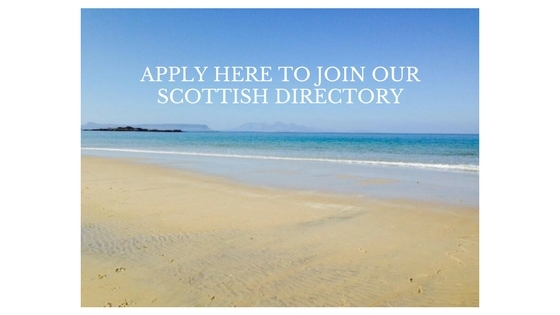 As a hotelier, this is the one award you really want to win as hotels cannot buy their entry. Visits by inspectors are anonymous and no money changes hands making the award impartial and extra special. We had only arrived, but it’s easy to see why they had won. Standards are incredibly high at Knockendarroch – not a speck of dust, scuff of paint or fingerprint anywhere! We have stayed in many hotels over the years, but Knockendarroch was the closest to perfection! We stayted in a Classic room with the comfiest King-sized bed, luxurious bedding and pillow perfection. The ensuite facilities came with both a bath and shower (always a bonus). 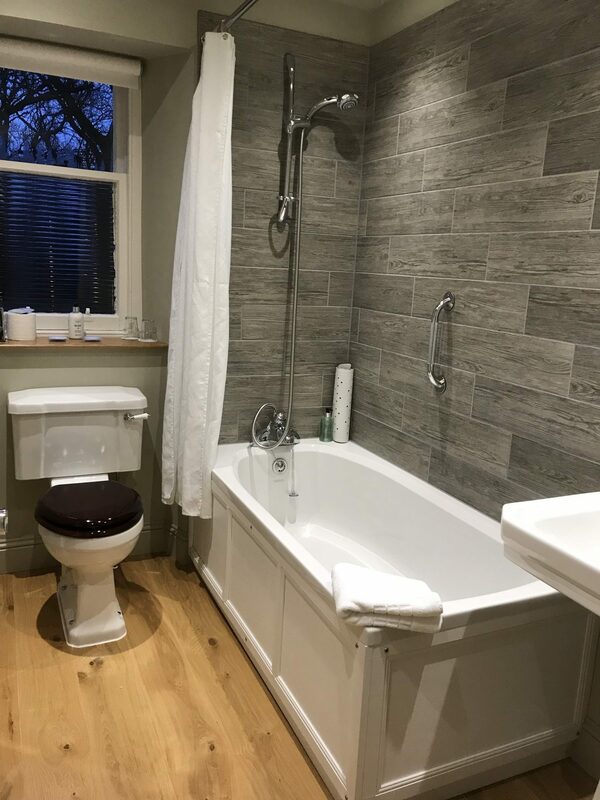 Full-sized Scottish Fine Soap toiletries made for the bubbliest of baths while the biggest and hottest towel rail ever was home to the waiting huge fluffy towels. Pure luxury! Balcony, Premier and Suites are also available, and it’s always best to book directly with the hotel for the best prices. If it’s a special occasion, you can arrange for a bottle of champagne, flowers or some local macarons from Gail at Nancy’s Macarons to be waiting in your room for you. Dinner was at 7.30 pm so it was suggested that we rendezvous back in the lounge around 7 pm for a pre-dinner drink with canapes by the fire while we ordered from the set dinner menu. How civilised! The guest lounge looked so inviting when we arrived back at 7 pm with the fires stoked and candles lit. There are plenty of cosy corners where you can enjoy your own private space or chat with others about the day’s adventures. It was a very convivial atmosphere, and the drams and canapes were flowing. 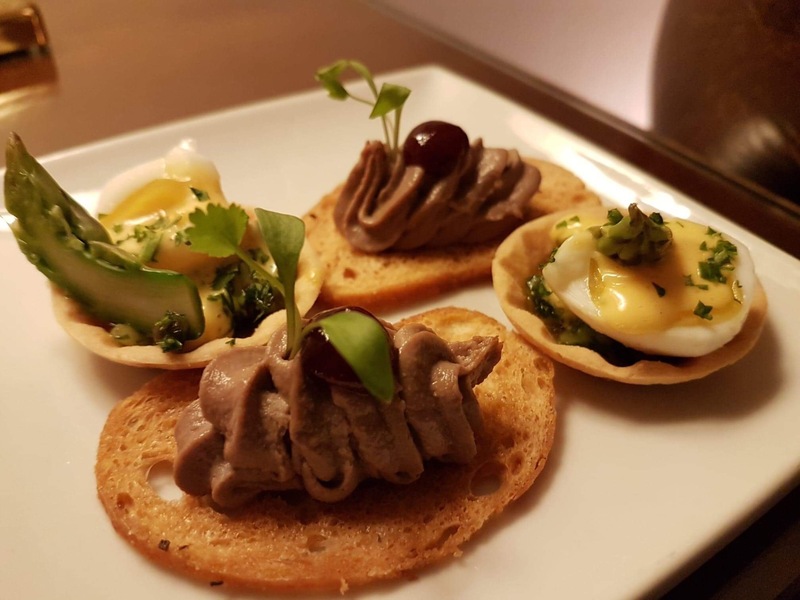 We decided to enjoy a Crossbill Gin and a Strathearn Heather Rose Gin both with tonic, as we nibbled on our quail’s egg and asparagus tart and duck liver pate and plum crostini. 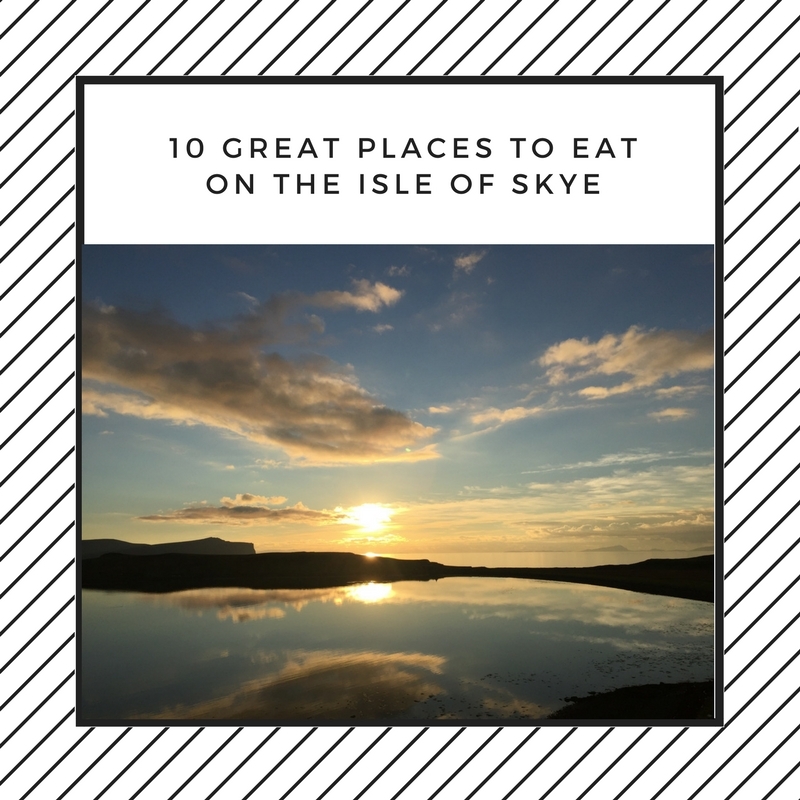 Good company, great gins, crackling fires, twinkling candles and tasty bites – it was going to be a fantastic night. We chose a bottle of house Pinot Grigio which was perfectly chilled and waiting for us at our table. How refreshing that a jug of Perthshire’s finest tap water arrived without the usual and unnecessary still or sparkling fuss. A choice of homemade poppyseed, wholemeal and chilli and mustard breads kept us going until our starters arrived. 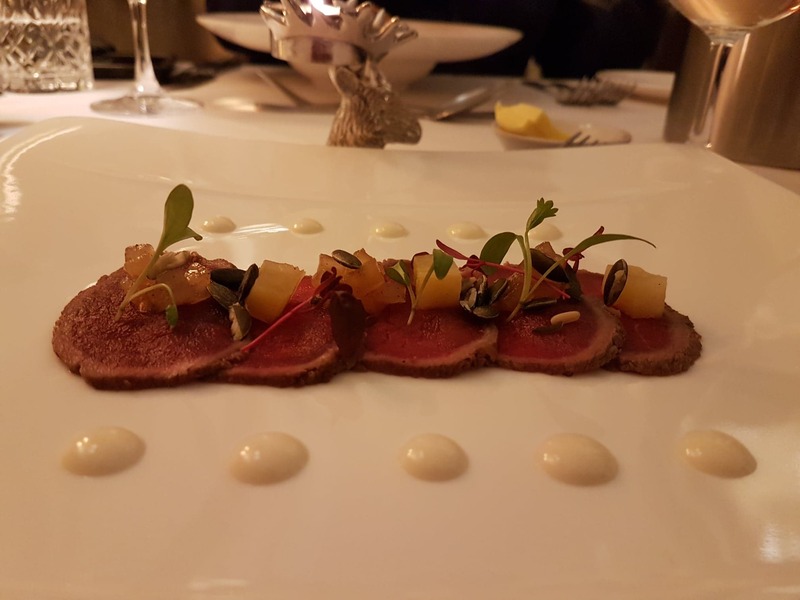 My Highland venison carpaccio was the perfect starter. The five deliciously pink slices of venison were so tender and cut like butter. The pumpkin seeds added crunch while the pear provided sweetness to balance the peppery horseradish cream. Raymond’s crispy nugget of crab cake was also delicious. Perched on a fruity avocado and mango salsa that packed a sweet chilli punch. The radish gave a bit of crunch and soy dressing the perfect salty bite. 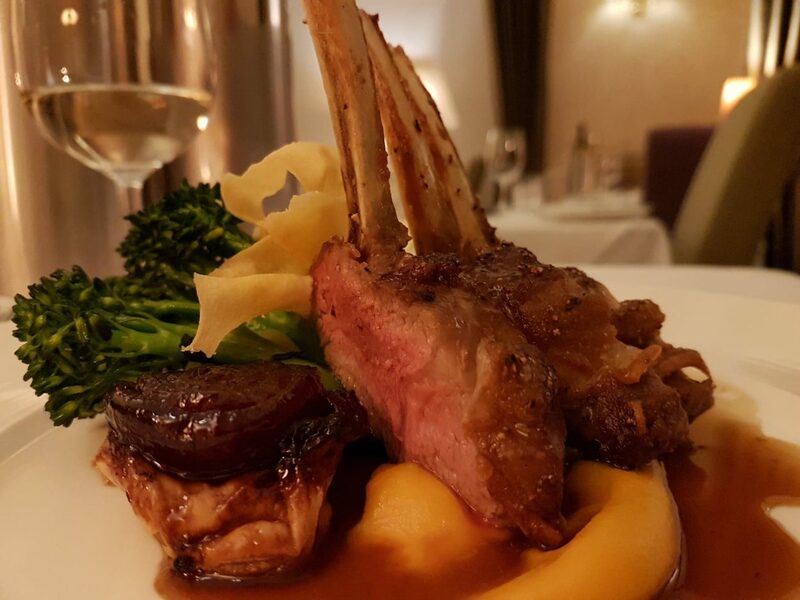 My Perthshire meat feast continued with an incredibly tender rack of lamb. Three meaty lollipops sat atop a bed of creamy, pungent basil infused mash. The red onion tarte tatin was outstanding, sweet, and caramelised on the top with a crisp base. A parsnip crisp topped the dish with more sweetness, and the broccoli helped with the five a day challenge. Raymond’s colourful plate was a gorgeous splash of winter colour. 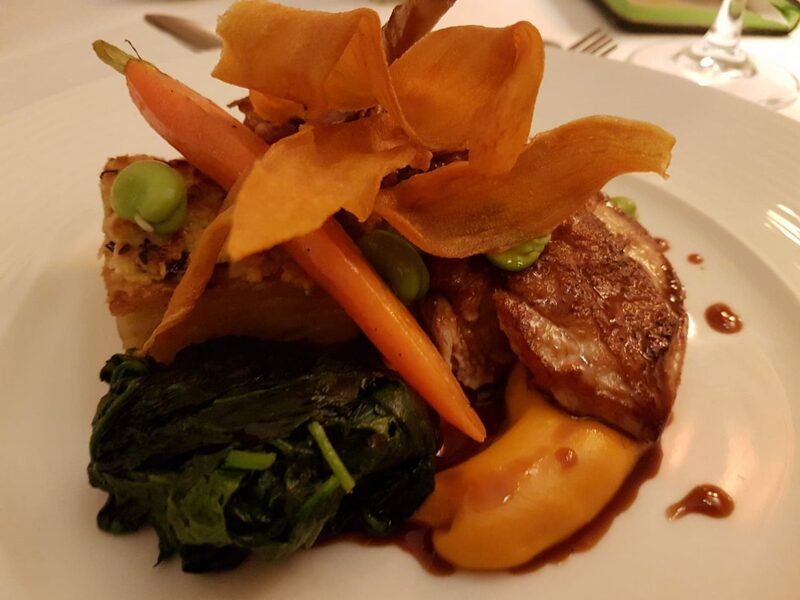 His guinea fowl was moist and full of flavour with skin crisped in a sweet paprika glaze. The rich cheddar and thyme dauphinoise was decadent and divine. 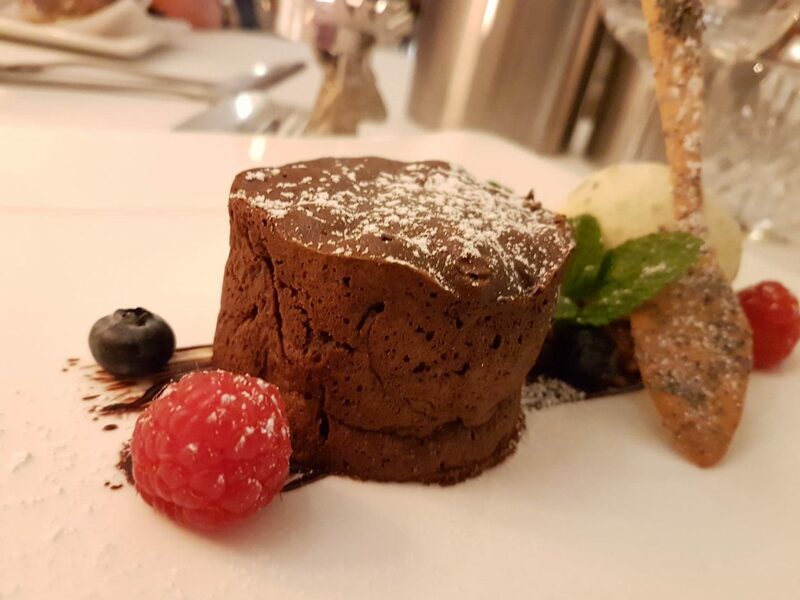 Dark chocolate and Edradour malt whisky fondant with chocolate paint, raspberries, poppy tuille and pistachio ice cream. The last time we visited Pitlochry, we walked up the Black Spout walk to Edradour, Scotland’s smallest distillery. After enjoying some of their malts, the dark chocolate and Edradour whisky fondant on the dessert menu caught my eye. Oh my goodness – a perfect gooey interior with a proper blast of whisky. Under any other circumstances, the sweet pistachio ice cream would have been a delicious dessert in its own right. 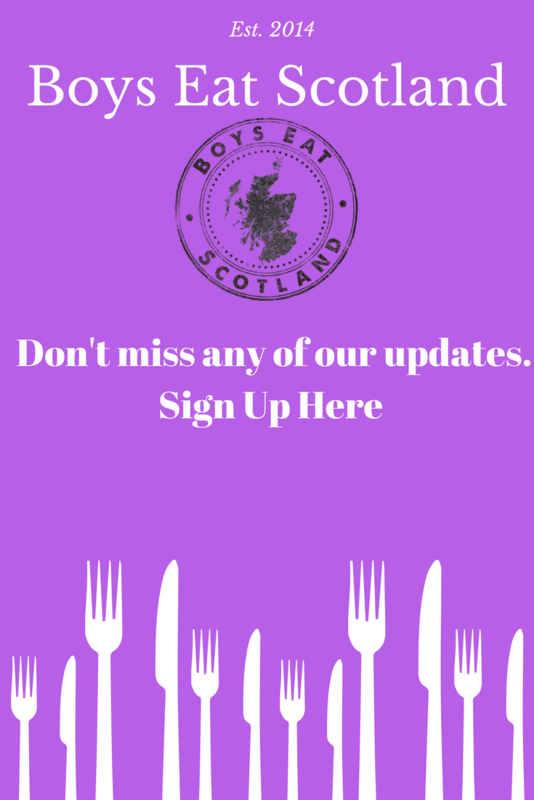 Check out the poppy tuille spoon too – how cute is that? Raymond’s dessert was billed as a cheesecake trifle but deconstructed beyond recognition. 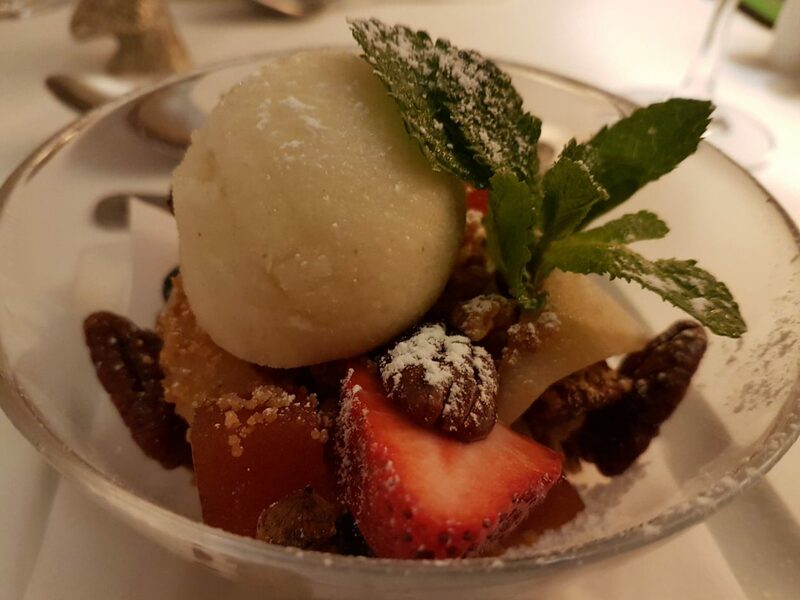 There were delicately poached pears surrounded with crunchy granola, strawberries and candied pecan nuts. Cubes of quince jelly and perfumed pear sorbet made this an unexpectedly light and refreshing end to the meal. The restaurant is open to non-residents so even if you’re not a guest, you can enjoy their excellent food. 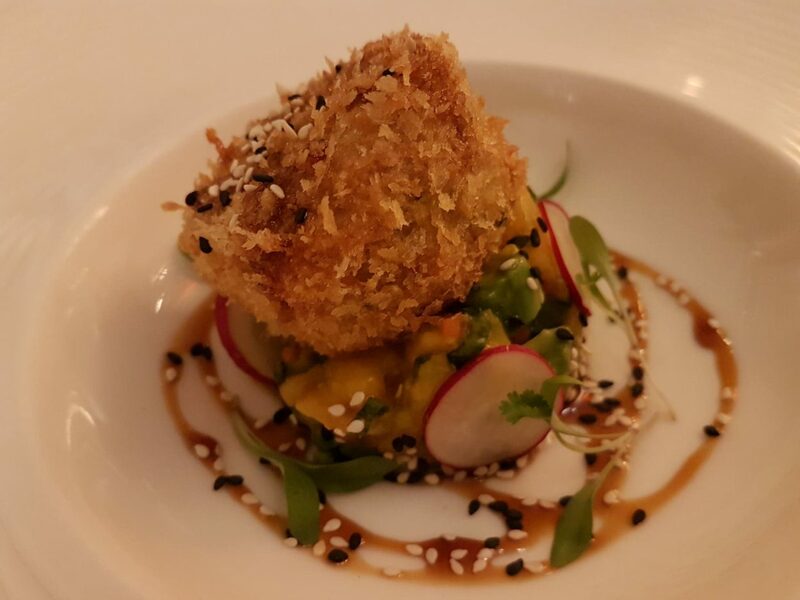 If you are visiting Pitlochry Theatre then Knockendarrock also offers a really popular Pre-Theatre Menu. Booking in advance is a must. Pitlochry’s main street is just a few minutes walk from the hotel, so after dinner, we had a wander into town. 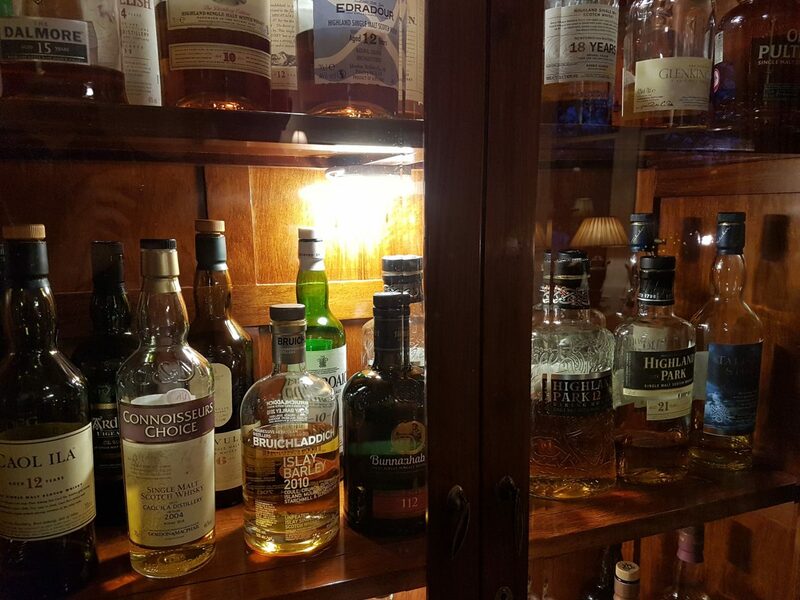 Many bars have live music at the weekends so there’s no shortage of entertainment while enjoying a dram or two. On our return, we popped our “do not disturb” owl outside the door and enjoyed one of the best nights sleep we’ve had in ages. 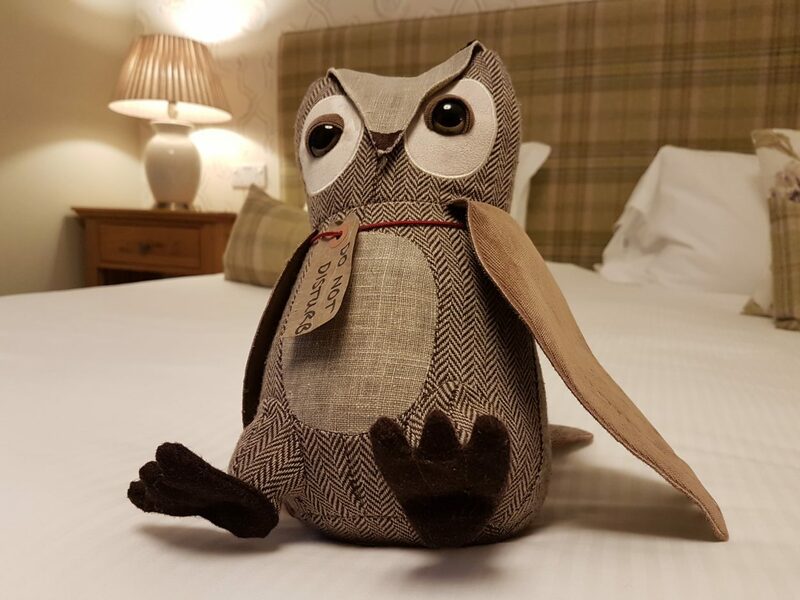 A combination of silence, a comfortable bed, luxurious linens, darkness and the perfect temperature sent us quickly into the land of Nod while our wee owl stayed up all night keeping watch at the door. Everyone seemed to arrive at the same time for breakfast, but this wasn’t a problem. Service was swift, very friendly and warm. You can order a selection of hot and cold dishes from the menu. These are freshly prepared in the kitchen and delivered to your table. Coffee is also served in a cafetiere which we love – there’s nothing worse than the coffee going cold before your breakfast arrives. We decided to try Knockendarroch’s homemade granola which turned out to be a feast in its own right. 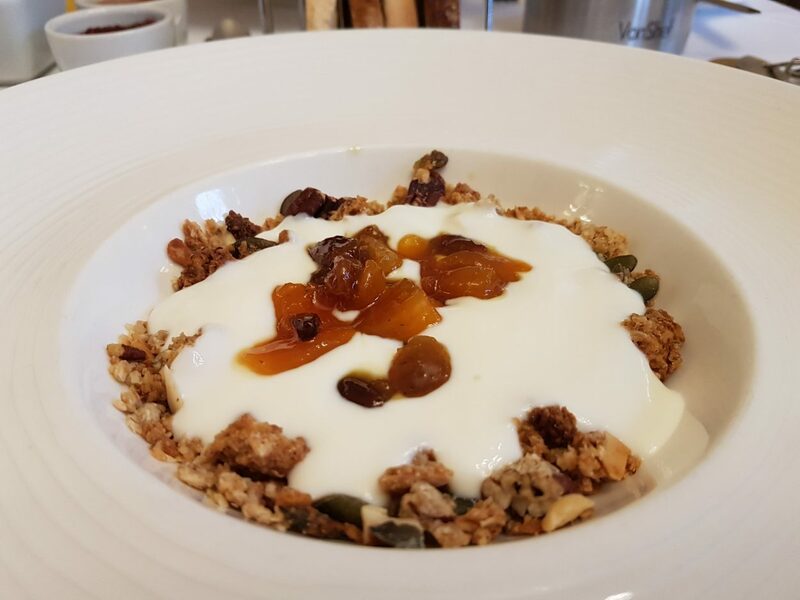 The granola was full of tasty oats, fruit and seeds and served with natural yoghurt. An extremely moreish sticky apricot and sultana compote tops the dish. If only we could have this made for us every morning. 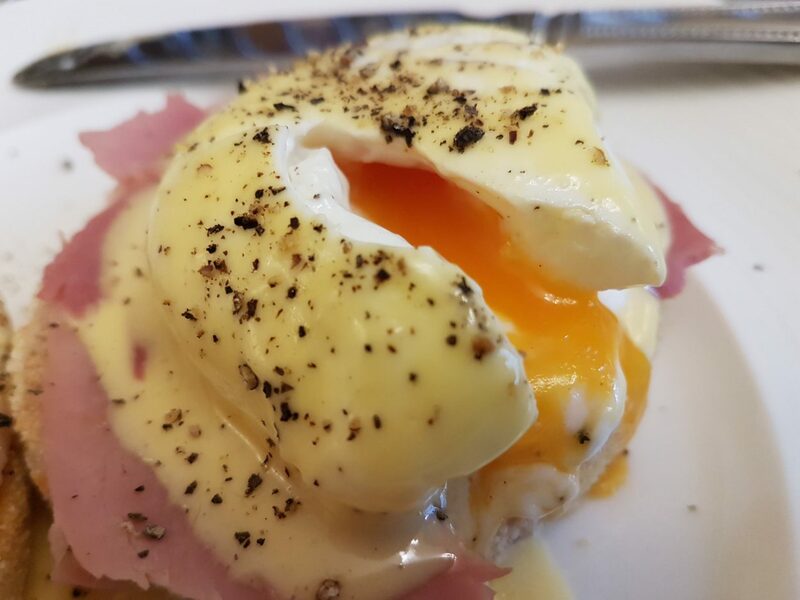 Raymond chose traditional eggs benedict over a full cooked Perthshire breakfast as a “lighter” option. 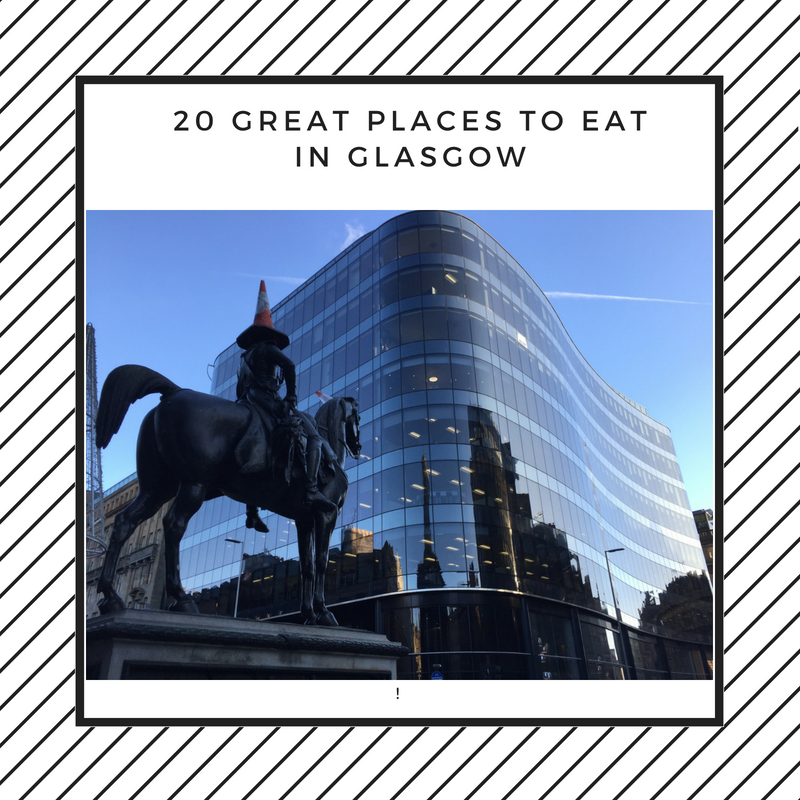 His eyes lit up when TWO muffins arrived rather than the anticipated one, and both came with roast ham and perfectly poached free-range eggs topped with creamy hollandaise sauce. I wasn’t being so good and went straight for the full cooked breakfast. 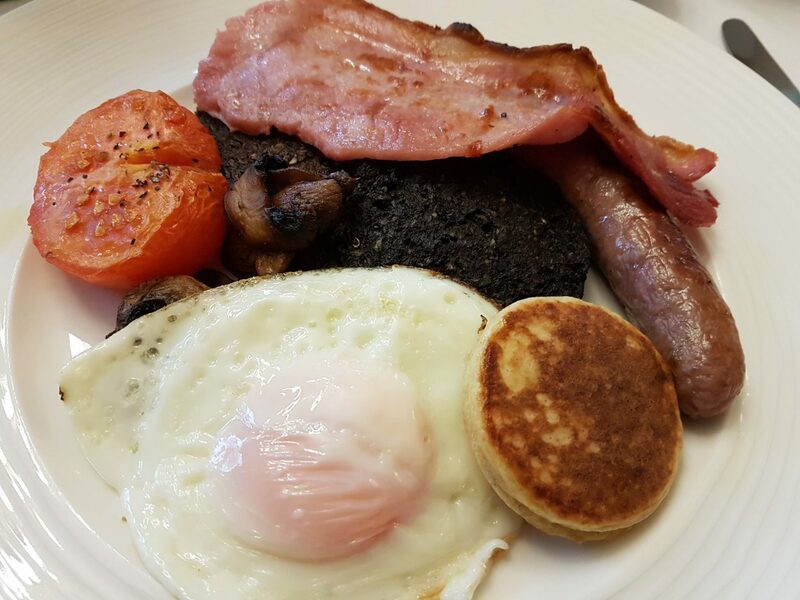 Perthshire sausages, bacon, black pudding, haggis, potato scone, grilled tomato, mushrooms and free range eggs are all available to choose from (a vegetarian version is also available). There’s also no shortage of toast and preserves and these along with fresh tea, and coffee top-ups are available throughout breakfast. This all makes for such a relaxing start to the day with no queues for the buffet or toast machine. We loved our visit to Knockendarroch. They have created an exceptional guest experience that offers genuine customer service from staff who care. The hotel’s main focus is on making you feel warm, welcome and comfortable. 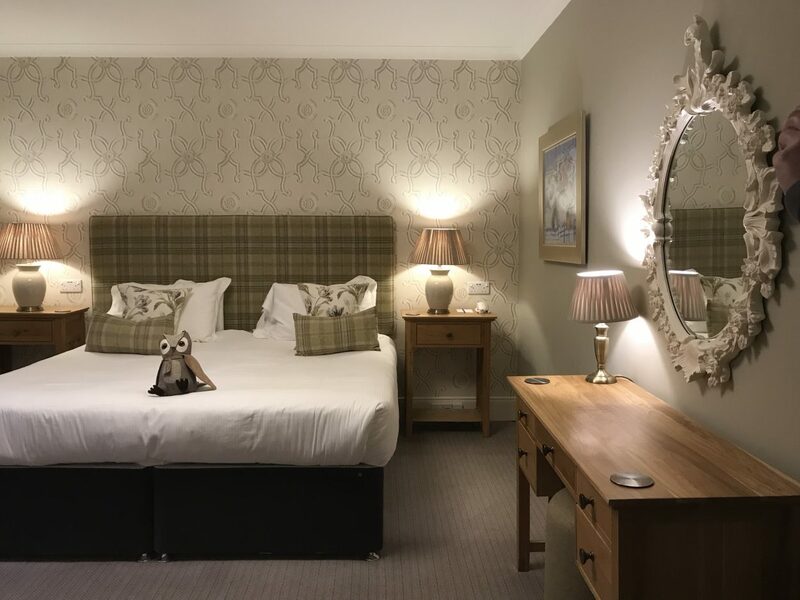 If you want a fabulous relaxing place to unwind without the five-star faff then Knockendarroch should be top of your list for 2019. Many thanks to Knockendarroch for inviting us to come along for Dinner Bed and Breakfast and check out Scotland’s Hotel of the Year. All drinks were paid for separately. Local Restaurant of the Year - The Whitehouse!